One of the biggest drawbacks of wood shingles is they’re more likely to catch fire than other shingle materials. The wood shingles’ installation process can be rather difficult for the uninitiated. You’ll also want to take preventative measures to keep your roof from suffering from the ravages of termites and mold. Some repairs that come with owning wood shingles include cracked, missing, broken or warped shingles. In most situations you will need to replace the wood shingles because they can’t be repaired easily. There are some cases where you can reseal the shingles, but it’s on a case by case basis. With mold or mildew, you can power wash off most of it, and the wood shingles will be okay. What is Class A, Class B, and Class C? There are three classifications of pressure impregnated fire retardant treated roofing systems. Both Class C and Class B treatments are available. Class B treated product is used with a special type of assembly to create a Class A roofing system. National Building Codes accept pressure impregnated fire retardant treated products and they are a smart addition to homes in areas where greater risk of fire exists. Does the fire retardant treatment affect the color of my cedar shakes and shingles? The color will be slightly darker brown, but they will weather to an appealing gray over time. Does fire retardant treatment reduce the longevity of cedar shakes or shingles? The CSSB is unaware of any reduced life span of Certi-Guard® cedar shakes or shingles. Can fire-retardant treated shakes be successfully painted? You should check with the treatment company to see if this is recommended and if it will affect your treatment warranty. Can I use fire retardant treated cedar shakes or shingles as siding above a copper roof? 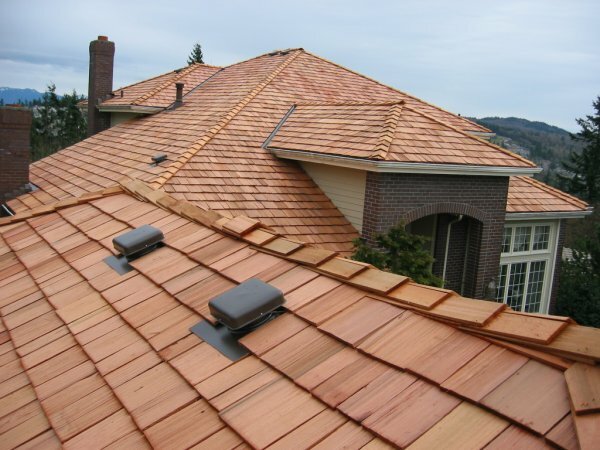 Certi-Guard® products will not affect the copper; the treatment seals any tannic acid into the shakes or shingles. Can cedar shakes be treated for fire retardancy and prevention of moss and mildew? You can treat for fire-retardancy OR moss/mildew prevention. These are two different treatments and are not currently available as one treatment. Fire-Retardant Certi-labelTM Premium and Number 1 Grades of Certi-Split® shakes and Certi-Sawn® shakes, and Number 1 Grade of Certigrade® shingles are available pressure impregnated with fire retardant treatment. These “Certi-Guard®” products may be used for Class A, B, and C roof systems. Contact the treatment company for treatment warranty information, accessory product requirements (including recommended fastener types) and application details for treated cedar material. Local code jurisdictions have additional information regarding applications in specific areas. Is there a fire retardant spray that I can use to make my cedar roof fire retardant? The CSSB does not support, endorse, or promote topical fire retardant treatments. How do I know if the product on my job site is treated? Look for the treatment label attached to the strapping. There should be two types of labels on treated product: 1) a mill label 2) a treatment label. I heard that wood roofs are banned due to fire risk. Is this true? In general this is not true. Class C fire-retardant treated products are accepted in most areas of California. Due to a lack of product understanding, there does exist a small number of cities/jurisdictions that do not allow wood roofs. However, the CSSB believes that this choice is misguided and has always been a vocal opponent of this type of decision, in the media, legislative, and court systems. Extensive product tests and in-field weathering have proven that Certi-Guard® pressure impregnated fire-retardant treated products do work and do last. Contact the treatment company for more details and technical assistance for your installation and local area. Ask us about pressure treated fire resistant wood shingles that not only protect your home but gives it the timeless appeal of natural wood.